Munich - The Bundesliga's Saturday afternoon programme is even more jam-packed than usual, with no Friday evening opener on Matchday 21 due to the midweek international action. Here's an overview of the best of the rest of the action, with Eintracht Frankfurt seeking to strengthen their grip on the fourth Champions League qualifying slot at one end of the standings while Greuther Fürth and 1899 Hoffenheim try to give their survival bids another boost at the other. The 29-year-old joined the Eagles on loan from Wolfsburg in January on an 18-month deal and scored both goals in last week’s 2-0 victory away at Hamburger SV - his first in the Bundesliga since netting for 1. FC Kaiserslautern on 14 May 2011. Head coach Armin Veh admitted it had been a risk to play Lakic, but it was certainly one that paid off. It is also likely to have been enough for the Croatian international to keep his place for the visit of Nuremberg. One man Veh will not have at his disposal for this one is defender Carlos Zambrano, whose return, like that of fellow Peru internationals Claudo Pizarro and Jefferson Farfan, was delayed by the Venezuelan authorities during a stop-over in Caracas on the way back from international duty. Der Klub haven’t had too many victories to celebrate this season – only six – but last week’s triumph at home to Borussia Mönchengladbach was a huge win, not least for Michael Wiesinger. In his third game in charge, the newly-appointed coach tasted victory for the first time in the Bundesliga. Facing high-flying Frankfurt in the Commerzbank Arena will be another stiff challenge for the Franconians. “They line up with an attacking formation and they have a lot of variation up front”, warned Wiesinger. “But that will open up space for us to play on the counter-attack.” Such a game could suit Nuremberg, particularly playmaker Hiroshi Kiyotake, who was in impressive form for Japan during the week. Hannover’s rather indifferent season has continued into 2013. New signing Johan Djourou was given a baptism of fire in the 5-4 defeat at Schalke, while a rather fortunate win over VfL Wolfsburg was followed by a limp 2-0 loss in Bremen, with both goals coming in the last five minutes. All true to form in a sense, though, for a side that has now lost eight of ten games on the road this season and conceded 39 times in total. At home, however, the 96ers remain a formidable side, losing just twice and having held defending champions Borussia Dortmund to 1-1 draw. They certainly have no shortage of options up front these days, with Artur Sobiech, Mohammed Abdellaoue, top scorer Mame Diouf and Ivorian Didier Ya Konan, who is “fit and ready to play” after returning from Africa Cup of Nations duty. Hoffenheim were in freefall before the winter break, but they finally got back to winning ways against SC Freiburg last weekend. The most evident change for the better has been at the back, where they have acquired a new-found solidity. Under new coach Marco Kurz there is more pressure on the ball, improved organisation at set-pieces is better - and a new keeper in Heurelho Gomes..
For Stuttgart, the past three weeks have been a painful experience. 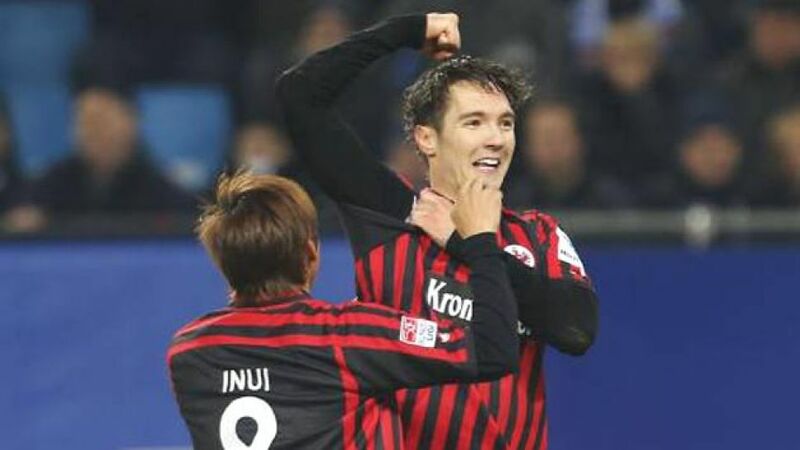 Die Schwaben have lost all three of their games in 2012, scoring just once and conceding seven, three of which came in a lifeless defeat at Düsseldorf on Matchday 20. Yet hope remains, as Stuttgart are traditionally a side whose form and results pick up dramatically in the second half of the season. Last year, for example, they took just one point from their first three games in the Rückrunde, before going on to accumulate 31 in their final 14 games. VfB could hand a home debut to new signing Federico Macheda after he took his Bundesliga bow against Fortuna. The Italian’s last competitive goal came way back in November 2011 in an English League Cup tie for Manchester United, but head coach Bruno Labbadia will hope that the 23-year-old can provide some much-needed back-up to top scorer Vedad Ibisevic, who has netted 10 of his team’s 22 league goals. Two in a row for Bremen? Thomas Schaaf’s Werder are another side to fall victim to inconsistency of late. They began 2013 disastrously with a 5-0 home defeat to Dortmund, before losing three goals and two players to red cards away in Hamburg. Those setbacks were tempered somewhat by an encouraging win, and performance, against Hannover, but until they can string a set of results together – they haven’t won back-to-back league games since November 2011 – the Green-Whites are going to find it hard to rise above mid-table mediocrity. This week they can welcome back Austrian forward Marko Arnautovic after his suspension, while Belgian midfielder maintained his good form in a victory for his country over Slovakia. In his pre-match notes, head coach Thomas Schaaf referred to his side’s apparent inability to wrap up consecutive wins, but insisted that it was “of no concern. We’re only concentrating on the game in Stuttgart.” Whichever way the match unfolds, goals can be expected: these two teams have served up 43 in their last ten meetings. One last attack that led to a looping, headed goal by Nikola Djurdjic to give Greuther Fürth only their second win of the season, at FC Schalke 04 last weekend. It was undoubtedly the highlight of the Clover Leaves’ season so far and served as a reminder to the rest of the league that, although still four points adrift of the relegation play-off place, plenty of fight remains among Mike Büskens’ men. Ironically it has been at home that they have struggled most, failing to win any of their ten games and scoring just four goals in the process. That doesn’t bode well against a Wolfsburg team that boasts Bas Dost and Brazilian international in its ranks. Both players have become key components of the Wolfsburg team in recent months, even more so under new coach Dieter Hecking. Yet after a promising start to his reign, the Wolves have stuttered somewhat in their last two games, losing the Lower Saxony derby at Hannover and being held to a 1-1 draw at home by Augsburg last weekend. They remain in 15th place in the league, prompting Hecking to reiterate that his team’s first instinct should still be to look behind them rather than in front, as well as warning that a tough task awaits his side. “Fürth are a team that fights. They’ll cover every blade of grass to try and win the game in front of their own supporters.” Wolfsburg may be the favourites, but Schalke supporters would have said the same thing last weekend.